Work is well under way to secure Singapore's future as a key port of call - most prominently in the form of the new Tuas mega port. But these efforts may be met with some serious competition as neighbouring countries such as Malaysia and Indonesia take on or plan for a range of large-scale infrastructure projects that will vie for transhipment business in the region. 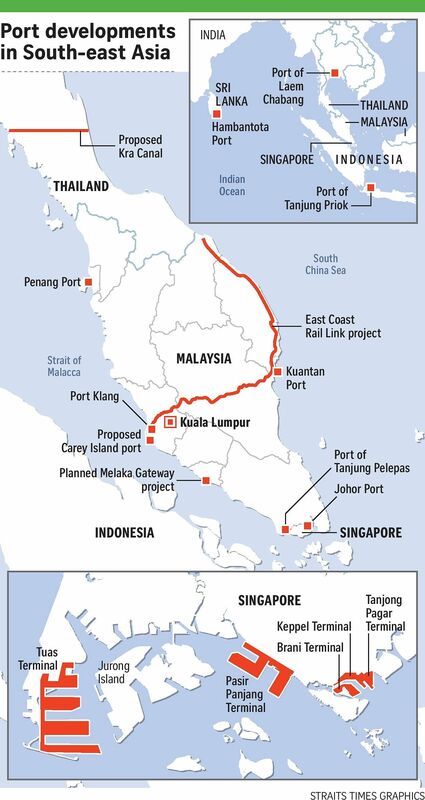 Malaysia, for instance, wants to build a giant port on an island next to its main Port Klang, while a new East Coast Rail Link (ECRL) has been touted as an "alternative trade route" that could see a projected 53 million tonnes of cargo bypass Singapore annually by 2030. The country's two key ports, Port Klang in Selangor and Port of Tanjung Pelepas in Johor Baru, have emerged in recent years as Singapore's closest rivals for transhipment volumes in South-east Asia. And the possibility of new trading routes such as Thailand's Kra Canal continues to be a wild card. In a report earlier this year, Credit Suisse economist Michael Wan had described Singapore's status as a major port to be "under threat". "Global warming is opening up the Arctic route, and China is already looking at more trade links through Thailand and Myanmar... So to say that Singapore will always be a pre-eminent logistics and sea hub is probably a bit of wishful thinking," he wrote. Malaysia has unveiled a string of infrastructure investments to achieve its maritime ambitions. These include plans for a number of deep-water ports - as part of the Carey Island port-industrial city project beside Port Klang, which is valued at RM100 billion (S$31.8 billion), as well as in the RM42 billion Melaka Gateway project. Meanwhile, the planned RM55 billion ECRL, slated for completion in 2024, will connect ports on the east and west coasts of Peninsular Malaysia, possibly altering current regional trade routes between the Strait of Malacca and the South China Sea through Singapore. Another new deep-water port in Kuantan, which is being developed with China in a RM4 billion expansion project, will be joined to the west coast via the ECRL to Port Klang. But Mr Tan Hua Joo of shipping data provider Alphaliner says it is unlikely the projects will have a significant impact on Singapore. The Melaka Gateway project, for example, will house only a small container port component, he says. "It simply does not have the scale to compete with Singapore or even its own Malaysian competitors in Port Klang and Tanjung Pelepas." Mr Victor Wai, lead ports analyst at Drewry Financial Research Services, is also not convinced the ECRL will take off in a big way. "Cargo owners will find it very expensive to use inter-modal transport if their cargoes are not meant for Malaysia," he notes. "Imagine having to pay to unload containers from vessel to quay, to load them from quay to rail, to pay for rail freight, and then to unload them from rail to quay on the west coast, and finally to load the charge from quay to an outbound vessel. The cost is going to be very substantial as opposed to transhipping." A train may carry only about 100 twenty-equivalent units (TEUs) in containers in a service, says Mr Wai. This is a tiny fraction of the 20,000 TEUs that mega vessels today can carry. Mr Tan believes the bigger challenge for Singapore will continue to come from Port Klang and Tanjung Pelepas, both slated to ramp up capacity significantly. Tanjung Pelepas also houses dedicated berths for Maersk Line, the world's No. 1 container shipping company. He notes that the combined transhipment volume from the two ports has grown in recent years, accounting for 39 per cent of the total transhipment cargo handled in South-east Asia last year. Countries elsewhere, like Indonesia, Thailand and Vietnam, have also announced plans to invest heavily in port infrastructure. But it could be difficult for competing ports to find anchor tenants, with many of the top shipping lines already in Singapore, says Ocean Shipping Consultants director Jason Chiang. Besides, the massive industry consolidation that has taken place since last year has shrunk the pool of players. The Pasir Panjang Terminal is the main South-east Asian hub for shipping lines and major alliances like Ocean Alliance, THE Alliance and 2M. It is also home to PSA's joint ventures with top carriers CMA CGM, China Cosco Shipping and Mediterranean Shipping Company. "Cost will remain a big consideration for shipping lines, but a lot of them have also invested in joint ventures here, which means savings and possibly even returns over the longer term," Mr Chiang says. "So it's hard to imagine them giving up the joint ventures. It will take a lot more than cheap rates for them to want to move." The idea of building a canal through the Kra Isthmus in Thailand came about hundreds of years ago, has been resurrected many times since and continues to linger as a potential threat for the Port of Singapore. The canal would connect the Gulf of Thailand with the Andaman Sea across southern Thailand - allowing ships to skip Singapore and Peninsular Malaysia, and cut up to 72 hours of sailing time or 1,200km in distance. But Mr Andy Lane, a partner at CTI Consultancy, is sceptical that the project, estimated to cost US$28 billion (S$38.2 billion), will even materialise. "The periodic rumours of a Kra Canal as an alternative to Malacca Strait do not appear to be realistic on many fronts." IHS Markit Asia-Pacific chief economist Rajiv Biswas similarly notes that the feasibility of such a mega project is still in question. He points to another potential game changer: the opening of Arctic shipping lanes, particularly Russia's Northern Sea Route, which runs across the top of Siberia and provides the shortest route between Europe and Asia. "The impact of global climate change on the Arctic ice cap is a real challenge for Singapore as the opening up of the Northern Sea routes will create a faster shipping route between Europe and North-east Asia," Mr Biswas says. He adds that around 6.5 million tonnes of cargo were shipped via the Northern Sea route last year, and "rapid growth is expected in tonnage shipped on this route over the next decade". Maritime and Port Authority of Singapore chief executive Andrew Tan says the emergence of alternative trade routes could affect trade flowing through the Strait of Malacca and Singapore. "We cannot be complacent, and will have to monitor these developments closely and respond to them," he tells The Straits Times. "Our stable government, our long-term and forward thinking, reliability and good track record are all strong attributes that we can rely upon to stay ahead of the competition." Singapore Shipping Association president Esben Poulsson notes Singapore is taking steps to modernise and expand its own container port. Earmarked as the centrepiece of Singapore's Next Generation Port vision, the new Tuas port will consolidate all container port operations, with a capacity to handle up to 65 million standard containers of cargo a year when completed in 2040. Its features will include deep-water berths to serve the mega vessels that are increasingly being used today, as well as technologies to boost productivity. Port operator PSA , for its part, remains confident about prospects, noting that it is "well positioned to meet the future growth of regional and global trade, and the long-term needs of our customers". Hardware aside, a strategic location has always been Singapore's stronghold, and will likely remain so - for now. "The biggest advantage we have is our location. So unless that changes, that advantage will still be there," says Mr Chiang. "Singapore should do whatever it can to boost its infrastructure, technology and service to stay on top of its game. But beyond that, it's really out of our hands."